California’s economy is the sixth largest in the world—it is vibrant and diverse and impacts the lives of people around the world. One important contributor to California’s dynamic economy that may actually be underappreciated for its impact is our life sciences sector. Last week, we were reminded how important it is. 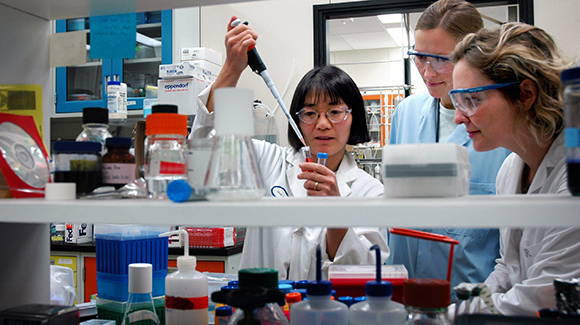 A new economic impact report showed California is home to 12,000 life science companies generating more than $316 billion in annual economic output. And those jobs are good paying with an average income of $108,000 per year. The variety of jobs available range from doctors and PhD researchers to middle-skill jobs in biomanufacturing and quality control. It's another reason why the sector is on the radar of the California Community Colleges' Strong Workforce Program. "Life science as a sector supports over one million jobs across California," said Van Ton-Quinlivan, vice chancellor for workforce and economic development for the California Community Colleges. "The Strong Workforce Program is catalyzing curricula to attract new students to this exciting field and to build the skills of those currently employed in this industry." No one appreciates that effort more than the life sciences industry itself. The source of the report, Biocom, is an advocate for California’s life science sector that works on behalf of more than 900 member companies to promote the industry and what it needs. Not surprisingly, the workforce issue is an important one to this dynamic industry. “We have great interest in workforce development," said Liisa Bozinovic, executive director of the Biocom Institute. "By adequately preparing our workforce through strong STEM education, industry and academic partnerships, informing legislators where training dollars are most needed, and helping companies develop their internal talent, we can help ensure that the workforce pipeline for California’s life sciences sector remains robust and serves as a catalyst for the growth of the state's economy well into the future." The industry is centered in the major metropolitan areas of the state. It tends to thrive around areas where private and public academic and research facilities are found. Community colleges in Northern California, and Los Angeles, Orange and San Diego counties in particular are developing programs to meet the demand of the industry. Direct employment numbers are impressive. In the nine counties that make up the Northern California cluster, 96,000 people are directly employed in life sciences, which support more than 300,000 jobs. In Los Angeles County, not often considered a major life sciences center, there are 2,400 different establishments in the sector with almost 70,000 people directly employed. And in San Diego County, where life science is a very influential employer sector, the industry boasts a competitive advantage—with a regional industry employment level far above the national average. For middle-skill workers, an important certification to acquire is CQIA—the Certified Quality Improvement Associate. Two community colleges, Citrus College and Irvine Valley College both offer online prep courses that anyone in California interested in acquiring that certification can take. So far, the Strong Workforce Program was praised by industry for working to align employer needs and curricula. “For instance, in Los Angeles County, where there are a lot players in the workforce issues, people better understand the demand and are nimble in making sure the courses are designed to fit what need in industry,” said Biocom’s Bozinovic. The California Economic Summit, now in its sixth year, identified workforce development as a key issue in making sure that California remain competitive in the global economy and helped drive the approval of $200 million in Career Technical Education funds for the California Community Colleges. “Industries like life sciences are critical to our economy,” said Jim Mayer, president and CEO of CA Fwd, which co-organizes the Summit along with the California Stewardship Network. "Preparing workers for the many good-paying jobs in this sector will help more Californians achieve the California dream, expand the middle class and benefit us all."